Cancun is not your normal backpacker destination but it is a cheap place to fly into, so if you are visiting southern Mexico or Central America you might end up here. Cancun has an awesome beach but it is set up for tourists on package holidays and not for budget conscious travellers. 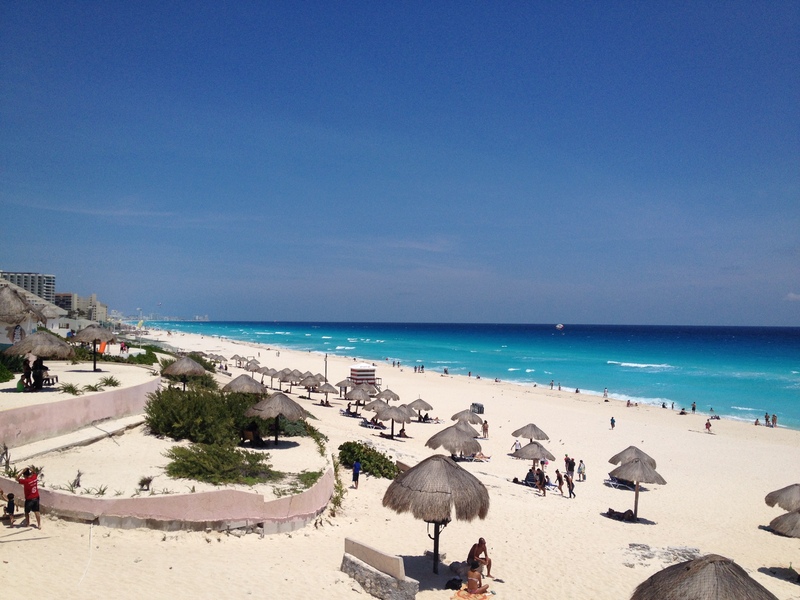 We found Cancun frustrating at first but slowly discovered how to enjoy Cancun on the cheap. This is our guide on how to survive Cancun as a backpacker. Unless you are going to an all-inclusive resort you are unlikely to have transport arranged to collect you. To avoid an over priced taxi ($25USD) we suggest getting the local bus. Both Terminal 2 and 3 have an ADO bus departing to downtown Cancun every half hour. The bus costs $66pesos each way and takes about 30 mins to get to Downtown Cancun Bus Station. The bus departure point for Terminal 2 is located outside of Domestic Arrivals (not international). If arriving internationally come out of the terminal and turn right until you find domestic arrivals. For Terminal 3 the bus leaves outside of arrivals. Unless you are lucky enough to find a great deal at a resort on the beach you will likely be staying downtown. Most hostels and budget hotels are based downtown and are within walking distance of the bus station or a bus stop. Being located downtown Cancun you have easy access to supermarkets and affordable bars and restaurants. For our few days in Cancun we stayed at Hostal Orquideas located on Calle Orquideas which is about a 10min walk from the bus station. We paid $525pesos per night for a private room with bathroom. The rate also included breakfast and dinner (winning). The hostel also offers dorm beds and all rooms had A/C. The hostel was very social as guests shared meals with each other and the staff were happy to provide advice on things to do and places to go. The cheapest and easiest way to get around is the public bus system. Routes 1 and 2 both go from downtown to the beach (Hotel Zone) and charge a fixed fare of $10.50pesos (about USD$0.50c). Buses are frequent but can get busy. We found the bus system very easy to use and never found the need for a taxi. The main reason to visit Cancun (other than to use the airport) is the amazing beach. Most of the beach is lined with huge hotels that reserve parts of the beach for their guests. The northern end of the beach can get very busy so we recommend that you use the bus and head south to escape the crowds. Towards the southern end of the beach is Playa Delfines which is a large public beach with no hotels in sight. The beach offers free shade and sun loungers and is accessible via bus routes 1 and 2. This beach is less busy as it is further from town but it is worth sitting on the bus that wee bit longer to get more beach to yourself. Bring a picnic and a few beers from the local supermarkets and enjoy a day at the beach! Going out in Cancun can be expensive. Most places along the strip by the beach require you to pay around $70-100 USD for an open bar and dance show. Trying just to buy a single drink was hard work but we did find a couple of places which would let us but the drinks were the most expensive of the trip. We missed our $1 beers from Lake Bacalar. Organise your own activities, the hotels charge a huge amount to explore the region and visit touristy cenotes and Mayan ruins. Some of the best ones were a local bus ride or a bike ride away and are easily located near Tulum and Valladolid. We got a cheap flight to Havana from Cancun. Cancun airport is a great gate way to one of our favourite places Cuba. You can organise your Cuban visas at Cancun airport just before departure, just arrive early to avoid stress. Once we returned from Cuba we were also able to jump on a very cheap holiday flight with Thomas Cook all the way to London. Sometimes these package deal companies have extra capacity on their flights. Thanks guys, great info about Cancun. I really appriciate for taking the time to putting it together.